Business of Kindness is just about to launch the “Rise of Caramel” Kickstarter. You can find a preview of everything I will be working towards on businessofkindness.com. In addition to caramel I have been creating Intentional Jewelry Designs. These are necklaces, earrings and bracelets made from symbolic and healing semi precious stones that work together to support personal goals and chakra balancing. 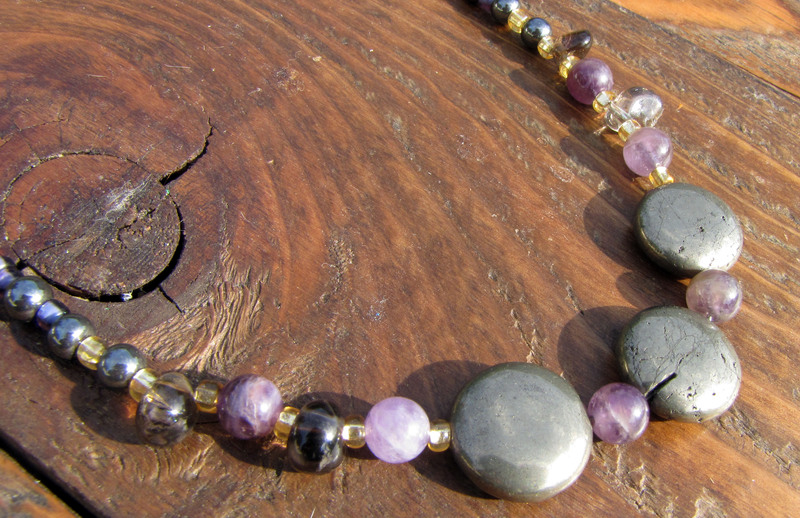 Each necklace comes with its own statement card and a break down of what each stone is historically recognized for. If you are drawn to a certain piece, check out the statement it represents and it may just resonate with you and vibrate your heart strings, or perhaps it will simply look fabulous on! Pyrite: Taps into one’s abilities and potential, stimulating the flow of ideas. It brings confidence and the persistence to carry things through to completion. Amethyst: Known for clear thinking, spiritual wisdom and protection. Smoky Quartz: A grounding stone that dissipates negative energy. Hematite: A grounding stone that improves relationships and boosts intuition.